Empire Day, 1948. A back street in Bondi is transformed as the bonfire and fireworks of Cracker Night cast a magical glow over its humble cottages. Australia is being transformed in this postwar era and the people of Wattle Street know that life will never be the same again. The 'reffos' have moved in, and their strange ways threaten the locals like Pop Wilson, deserted mum Kath and sharp-tongued Maude McNulty. Mistrust and misunderstandings abound on both sides. To Hania, an angry teenager struggling to cope with her hysterical mother, and to Sala, an unhappily married woman trying to blot out her traumatic wartime past, the Australians appear enviably carefree. But behind closed doors, old as well as new Australians suffer secret heartaches. As the smoke of fires past and present gradually disperses and the lives of the two groups entwine, unexpected relationships form that bring passion and tragedy for some, and forgiveness and resolution for others. 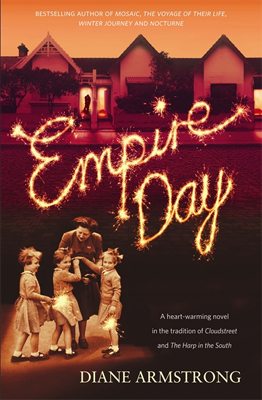 Part love story, part mystery and part crime investigation, Empire Day is a dramatic and heart-warming novel in the tradition of Cloudstreet and The Harp in the South and will bring a smile of recognition to Australians of all ages and backgrounds. It confirms Diane Armstrong as one of our most gifted and compelling storytellers. Diane Armstrong was born in Poland and arrived in Australia in 1948. At the age of seven she decided to become a writer. She has enjoyed a hugely successful career as a freelance journalist. Empire Day is her fifth book. All her books have been bestsellers which have been short-listed for major literary awards, and her last novel, Nocturne, won the Society of Women Writers' Biennial Fiction Award. Her books have been internationally acclaimed, and have been published in Europe, Israel and the United States.